My first attempt was to start from an empty solution following the online documentation (https://documentation.galaktika-soft.com/xafari/index.html?vertical_grid_property_editor_start_here.html). Result was unsuccessful with either getting an exception when clicking to open detail view from list view or getting an empty detail (have already submitted this ticket – was used with trial version of xafari v14.2.407.40). At my second attempt I started with the included demo of XafariFeatureSet (using updated xafari v14.2.507.114). Created a new object under folder DCTests copying all the logic from VerticalGridPropertyEditorObject. I also created the required method to seed data in Updater.cs (CreateDCVerticalGridEditorObjects) and the accompanied BOModel and Views (ListView, DetailView and LookupListView) in Application Model always copying/cloning the preexisting ones. End result was a generic XaF ListView & DetailView (not vertical) and also properties not seeded correctly. Can you provide any insight on what I have done wrong? Below I have described step by step how to use VerticalGridPropertyEditor. I performed all listed actions on the sample solution which you sent. 2. Check whether all needed modules are added - all OK.
4. 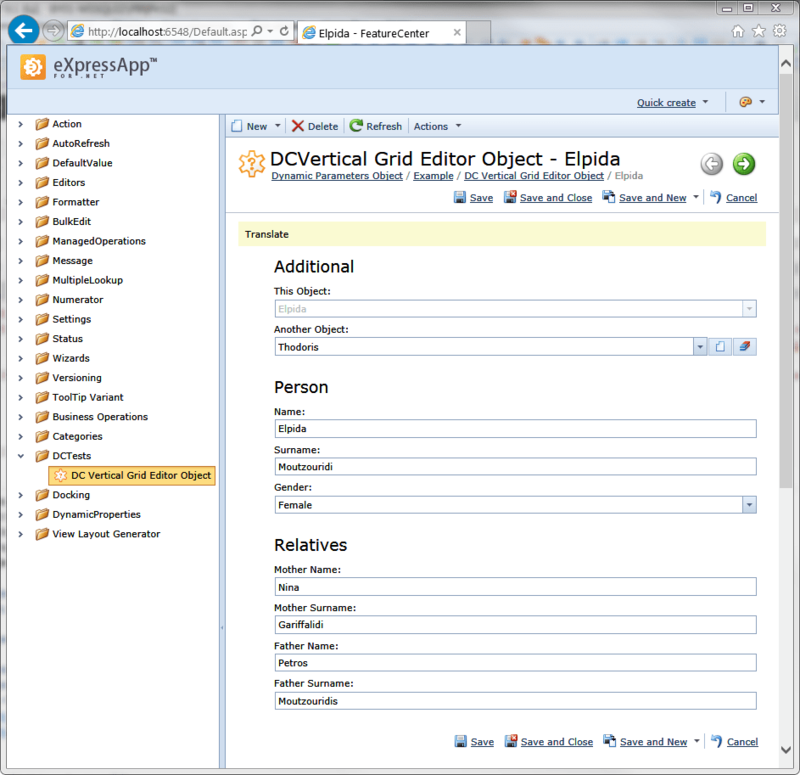 Open the application model in the project _Xafari.FeatureCenter.Web.App. 5. Find object Xafari.FeatureCenter.DCTests.DCVerticalGridEditorObject in the model. 6. Create a new DetailView and name it DCVerticalGridEditorObject_Verticalview. 7. Add a new ViewItem for the property DCVerticalGridEditorObject.ThisObject in the newly created DetailView. 8. Specify PropertyEditorType with Xafari.Editors.Web.WebVerticalGridPropertyEditor for the ViewItem. 9. You can see VerticalGridPropertyEditor as the example of its use in MasterDetailView. But in web applications MasterDetailView is not supported by default (out of the box). Therefore, to demonstrate using of VerticalGridPropertyEditor I change DCVerticalGridEditorObject_Detailview for DCVerticalGridEditorObject_Verticalview as a DetailView in the model for DCVerticalGridEditorObject_ListView. 10. Run the application. 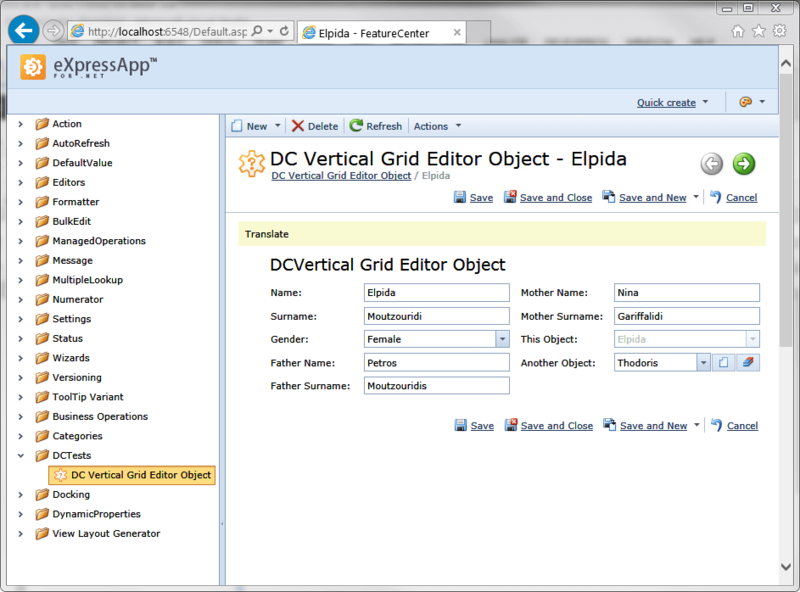 Open the ListView for DCVerticalGridEditorObject in the navigation pane. Click "Edit". In the opened form DCVerticalGridEditorObject_Verticalview you can see that it differs from DCVerticalGridEditorObject_DetailView generated by default.